The growth in freelancers in the EU since 2004 has been remarkable. Numbers have increased by 45% from just under 6.2 million to 8.9 million in 2013, making them the fastest growing group in the EU labor market. Freelancers represent a significant segment of the workforce generally, making up 25% of all those working in professional, scientific and technical work and 22% of all those in arts and entertainment. In the UK, self-employment is now growing 4% faster than traditional employment, 4.37 million self-employed in 2013. 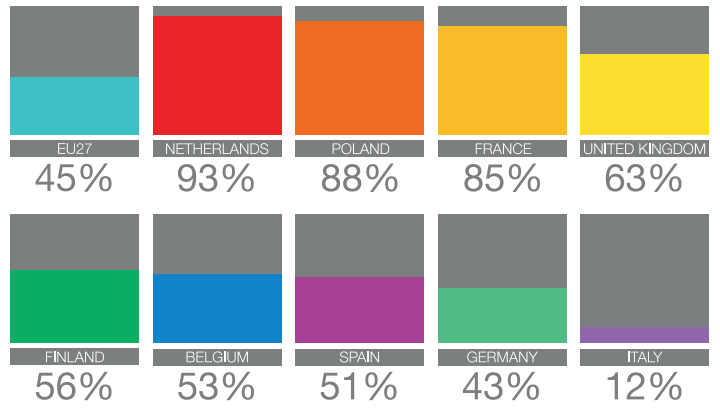 The Netherlands has seen 92% growth in freelancing over the last 10 years. 31.9% of Greeks and 23.4% of Italians are now self-employed. In Spain and Slovakia, 13% of the work force are self-employment. In Russia, the share of freelancers in the IT sphere is 35% of the total labor market. 14.5% of employed Europeans are self-employed.